I really enjoyed the first one, and I love the cover. When I finished reading Gates of Thread and Stone, I had so many questions. The Infinite addresses some of those questions, raises a few new ones, and generally satisfied my desire for solid fantasy. I would definitely recommend reading Gates first rather than The Infinite as a standalone. I think it's possible to read it by itself, but that the emotional weight of the relationships will be much reduced. I continue to enjoy Kai's voice quite a bit. I like after being hyper-focused in the first book on rescuing her 'brother' Reev, that she's a little bit lost in The Infinite. Between trying to figure out what kind of relationship she can form with the new Avan, feeling a bit of distance between herself and Reev because she's matured so much in his absence, and then being sent off on this sudden diplomatic adventure, Kai has a lot on her plate. Really, the only problem I had with The Infinite is that I didn't feel that there was a particularly good reason to make Kai the ambassador, as it were, to a foreign land. Though she may have some pretty spectacular lineage, I don't think that in and of itself qualified her for any kind of diplomatic or investigative work. And she certainly hasn't had an upbringing that suggests she'd excel in the field - yes, she's tough and determined. There are some great twists and turns in this book, and I loved the way it all came together. I wanted to hug Kai several times because, damn, her life gets rough! On the romantic front, I loved how the novel handles Mason. Though I'm not a fan of the typical YA love triangle, I think that the treatment of it in this book is very mature (and really, kind of not love triangle-y). I think Mason's a sweetheart, and is pretty darned insightful. I want good things for him. Also, I want to see Reev gobsmacked by love. Truly, I just want all these characters who have been put through the wringer to end up ridiculously happy. I know the novel's a success because I *care* about their fates! Loved the way the book ends, and I really want a third in the series *now. * I was spoiled by being able to read the first two back-to-back. 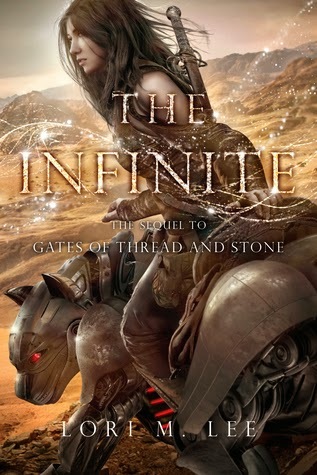 Definitely pick up The Infinite, but also get Gates of Thread and Stone because if you don't read them together, you're doing yourself a disservice.